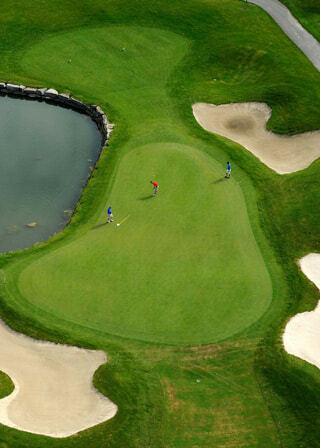 Take your marketing to the next level with a golf course aerial video tour. Viewers will soar above your greens through the lens of our unmanned aerial vehicle (UAV), taking in the spectacular views and gaining a new appreciation for the layout and amenities of your location. Capture each individual hole to give members and guests an edge before their next round by helping them get familiar with the fairway. Embed the videos on your website or in a custom mobile app to get maximum impact from your flyover tour. Enhance your visual tour with interior photos and videos of the club house, gift shop, meeting facilities, and other features. Video creates an emotional connection that will draw viewers to your location, and prompt them to share the scenic views with friends. Our experienced RC drone pilots will navigate your Dallas golf course with one of our state-of-the-art helicams to capture HD footage of the terrain and the specifics of each hole. If your facility is outside of the DFW area, we can easily travel to any part of the country or even outside the U.S.
From the vibrant colors to the sweeping panoramas, viewers will be captivated by the aerial video tour — driving more visitors to your door. For a free quote, call 972-318-2811 today.